Friday’s are finally returning to the Kino blog after the last month’s delay and if you’re interested in checking out my last interview with Zany Zainou, definitely do. Apologises there has not been any feature for sometime but you’ll all tell me not to apologise. All that matters we’re here now and let’s just get into it !! Please to introduce you too Allison from Bloom Reviews. This female blogger whom I started following last year sometime, her whole blog’s dedication to the genre romance. Instantly pulled me in and I’ve been a fan to come back when I can, like with all the blogs I follow. Allison purely focuses on romance in anime, manga, comics and gaming – with on the side her weekly news. Allison is a sweet soul and you can see that in her writing. Her long philosophical articles are always an interesting read, I’m always learning something new. If you love romance, shoujo she’s a blog you need to follow. !! Lita: What was the first anime or manga that had you attracted to this “weird” medium? I wouldn’t really call anime and manga weird. It’s no weirder than say US cartoons like Courage the Cowardly Dog or Invader Zim, though it definitely does have its moments. Does anyone remember the anime from last year or the year before that was basically an idol group made up of marble busts of historical figures? What was up with that? But I think like many Toonami-era fans, I got hooked on the medium through shows like Dragon Ball Z and Cardcaptor Sakura. I used to be a huge DBZ fan and had a whole bunch of the VHS tapes back in the day. I can’t really remember what was my first manga, but some of the earliest series I used to read were Kare Kano and DN Angel. I used to trade them back and forth with friends at school. Lita: “Bloom Reviews” it has such an charming ring to it. Is there a particular reason you chose this charming blog title? For the record also what is your favourite flower? Thank you! It actually references the tendency of shoujo romance manga to use flowery effects around their protagonist when highlighting different emotional moments. Since my blog is dedicated specifically to romance, I thought it was fitting to pick a name that had multiple different meanings. Bloom as in the flower effects in manga. Bloom as in growing emotions. Bloom in reference to flowers, a symbol of romance. For my favourite flower…I think I might have to choose a morning glory or an iris. They’re both really pretty, but I should probably look into flower language at some point. Lita: Shoujo genre is a dangerous fandom for us fangirls. How did you come to have an interest in the genre itself? Was it a series that just knew had to swoon you over? I’ve always been an avid reader of the genre especially in its prose form. It probably started with prose books and morphed over time after I realised how many different genres anime and manga had to offer. And while I was a big DBZ and shounen fan early in life, I tended to gravitate more towards shoujo manga during high school, thus my love was born. Series like Kare Kano, Imadoki, DN Angel, and Skip Beat offered me so many different romances to enjoy. Now, I still love reading shoujo for the mostly the same reasons, but I think I’m more interested in the nature of human relationships, the kinds of themes that wind up being discussed, and the different kinds of discussions or displays of psychology and social issues you can find in a lot of these series. Psychology is a major interest of mine (I actually have a degree in it), so I love seeing how series discuss issues of bullying, mental illness, and the nature of love and romance. It just so happens that shoujo offers a wide range of stories that tend to cover these themes. Lita: If you could be any shoujo female protagonist from any anime or manga series for a day, Who would you want to be? If so, why? Oh, this is a tough one. I think I might have to choose Shirayuki from Snow White with the Red Hair. She’s got guts, a great personality, and an interesting profession as well as a handsome prince on her side. Herbology is really interesting to me, so I loved seeing her use her knowledge of plants and medicine to solve problems and get out of jams. I’m kind of jealous that she gets to work with plants all day and go on hikes in the mountains to collect herbs. It sounds like a lot of fun. Lita: In three reasons what makes your anime blog different from the rest? For one, I focus exclusively on one genre: romance. There aren’t a lot of blogs that I have seen that do this especially anime and manga bloggers. I do occasionally talk about other things when I do more long-form articles, but all my reviews are of one genre. Two, I try and incorporate western comics into my line-up of reviews both because I like reading them too (and sharing that love is half the fun of reviewing) and because it allows me give manga readers something new to consider reading for themselves. Three, I don’t do episode reviews. Partly because I don’t have the time to and partly because I don’t think I’d have enough to say every episode for a full post. I actually tend to go the other way, with the occasional longer, fully researched articles. Lita: You’ve been around in the anime blogging scene for sometime now. What do you enjoy about the community? Haha, I wouldn’t say I’ve been around for that long. It definitely doesn’t feel like it at least. When I was trying to decide the best platform to host my blog, I chose WordPress because of the large aniblogging community here. Everyone has been incredibly supportive and I love how everyone takes the time to read each other’s posts and encourage each other to write better and better things. Everyone has such interesting posts too, it’s been encouraging me to write more creatively and think outside of the typical review posts. Lita: On the odd occasion I’ve seen on your twitter you visit a comic shop each week, to pick up a manga or comic. Good on you but I was curious, what are your thoughts on people reading manga digitally as opposed to buying a physical copy? Do you yourself prefer reading through pages than an screen? I think it’s a matter of personal choice. I used to read a lot of manga digitally, but lately I’ve found that having physical copies of at least my favorite titles feels more rewarding. I like seeing them all lined up on my bookshelf and it’s easier to quickly pick out a manga to read when they’re all right there. I also like the interaction and good feelings I get from going in and supporting small comic shops instead of buying from giant corporations like Amazon. It’s easier for me to see that my money is going towards supporting something worthwhile and local in my community as well as the manga industry as a whole. I’ve also found that it’s easier as a manga reviewer to be able to quickly flip through a physical copy to pick out a good page or panel than it is to click through an ebook. It makes manga reviewing faster and easier at least for the way I tend to develop my posts (that is, almost always at the last minute). But I can see the advantage of having a digital collection too: less space needed and you can access it anytime from a small tablet or your computer. Like I said, it all depends on personal preference. My only request would be to try and buy official copies whenever you can and steer clear of scanlations if you can help it. Overall, it’s better for the manga industry that way. 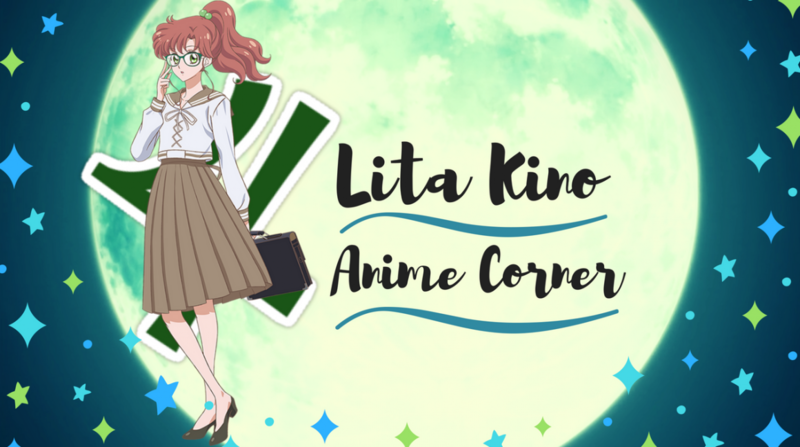 Lita: Does anyone in your life know you have your own anime blog? If so, what was their first reaction? Actually, most of the people in my life know I have an anime blog, and have been incredibly supportive. It’s probably because the vast majority of my friends are also anime and comic fans. My parents may have been the most unsure about my decision, but I think my Mom is just happy I’ve found something to be passionate about that I’ve wound up sticking to for a long time. I have a bad habit of getting excited about something for a while and then moving on to the next thing, so this blog has been an accomplishment in a way. I’m also so grateful to have a fiance that supports my passions and lets me spend hours talking and writing about anime and manga, and not complaining when my comics start overtaking all of our book shelves. Lita: You’re on an island, alone with your favourite shoujo boy, he’s half naked (still swimming trunks on) what would you do next? Oh dear, I guess the first decision to make would be which shoujo boy is my favourite. My first and best love has always been Youko Kurama from Yu Yu Hakusho. It’s not exactly a shoujo, but Kurama is dreamy enough to qualify in my book. Putting aside the image of Youko Kurama in swim trunks for later….I guess I would enjoy some snuggling in the shade and pets of those fuzzy fox ears. Lita: What is one of the most important things you’ve learned from blogging for yourself, which you think others will benefit from? I think one of the most important lessons I’ve learned is how to commit myself to writing, which includes structuring my time and balancing what I know I can do with what I really want to do. I knew I wouldn’t be able to do daily posts with all my other commitments, and I knew forcing myself to keep to a schedule like that would be detrimental to my writing overall in the long-run. So it kind of balanced out that I would try and do two posts a week, and if I wind up having time for more, great, if not, that’s fine too. It’s important to realistically look at how much you can manage in your overall schedule so you don’t burn yourself out from doing too much at once, but it’s also important to sometimes push through those times you just don’t have the desire to write. For me. I found that while I did have a few moments of creative energy that drove me to write, I had a lot more moments where I really wanted to just take a nap or curl up and read. It’s in those moments that sometimes you have to muscle through, because in the future you’ll feel more accomplished and better about yourself and your blog. I guess in all this rambling, what I want to say is try and find a balance of work and rest that meshes well for you, but also know that commitment takes effort and building a stable routine of writing can only help in the long-run. I wanted to say thankyou so much for Allison in letting me interview her and for giving such fun answers to my questions. Definitely check out this shoujo girl and what she does over on her blog. I hope you all enjoyed this Friday Feature return and look forward to next week for certain!! I’ll see you all next post and Friday!! Kurama is such a cutie! Although I love human Kurama’s red hair.